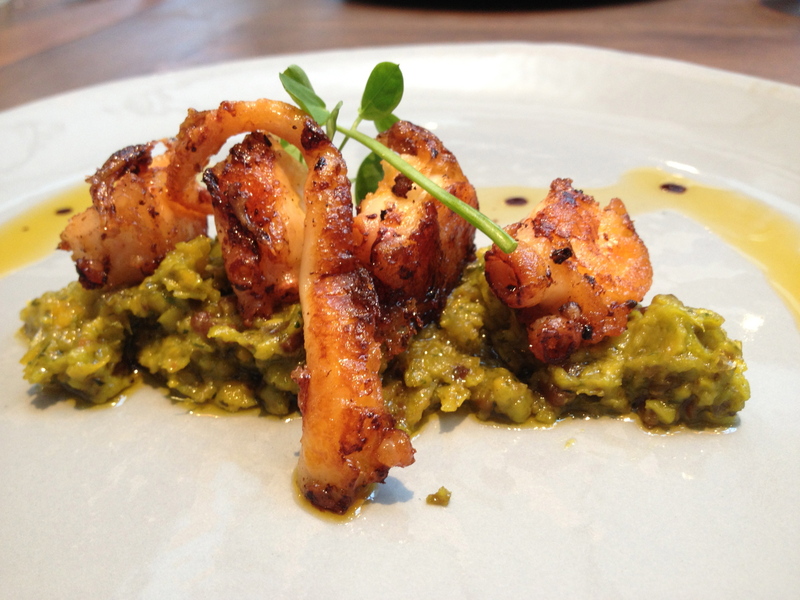 You are currently browsing the category archive for the ‘Latin American food’ category. 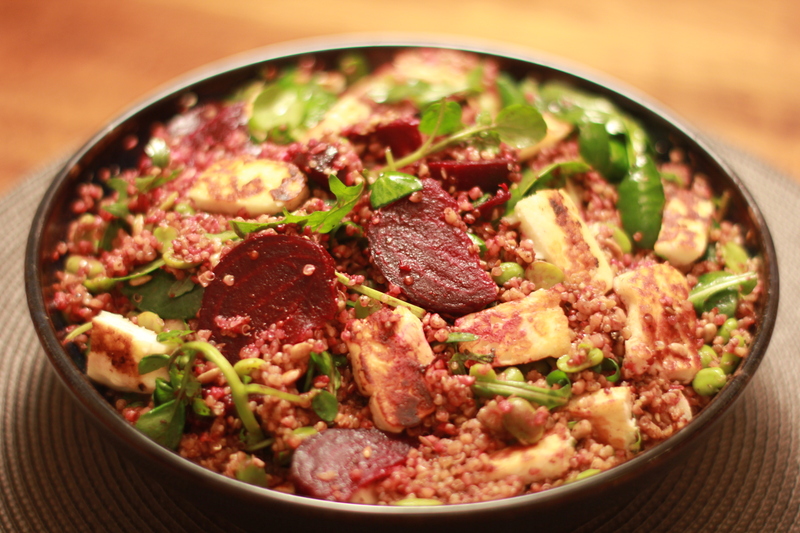 Sometimes, your cooking plans are derailed by ingredients not being available but in the last couple of weeks, mine have been inspired by unusual ingredients turning up in stores. I knew I wanted to make some kind of salsa when a bout of warm weather cut through our rainy Spring, but I hadn’t exactly imagined that it would centre around kumquats. But there they were in a basket at the Taj grocery – wintery fruits that I usually associate with Christmas but that offer an bittersweet citrus punch not dissimilar to Mexican naranja agria. 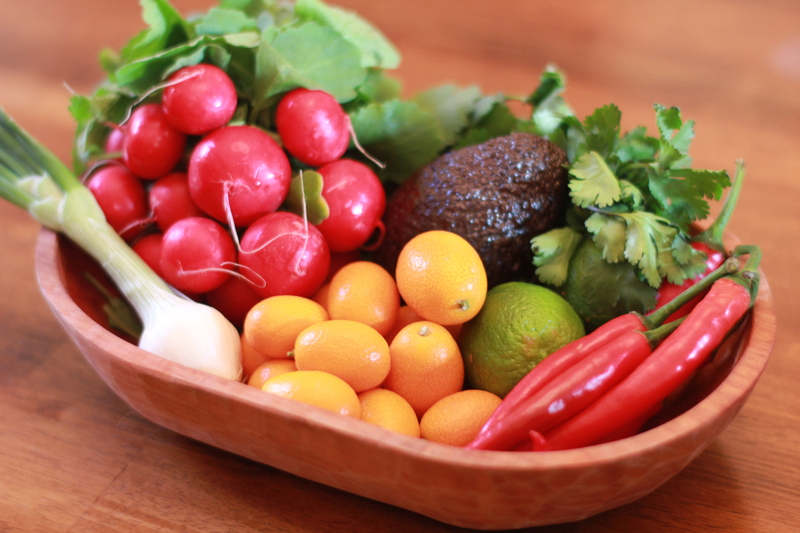 As soon as I saw them I knew I had to include them in my Spring salsa, so I poked around for ingredients to balance their chewy acid pleasures, coming up with plump little radishes, long red chilies and soft avocado. This recipe barely qualifies for the name, but it makes a substantial salsa that could function as the major component of a plate, not just a condiment. 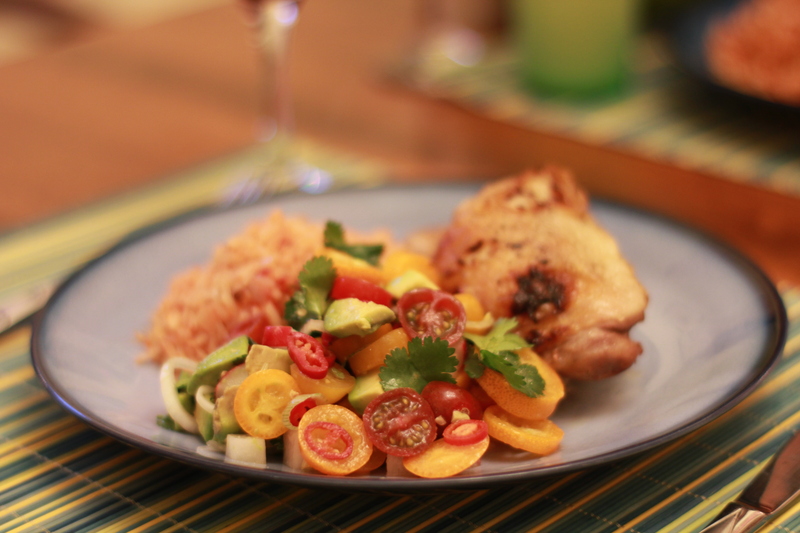 We ate it with grilled chicken and tomato rice but it would make a simple supper with just a rice bowl, or a vegetarian meal with Mexican black beans and rice. 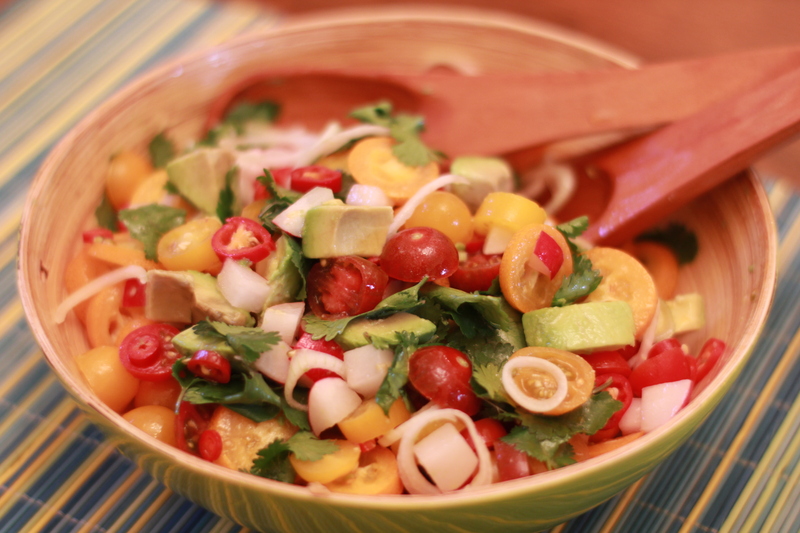 You basically just have to wash and chop everything – avocado into chunks, spring onion, chilies and kumquats thinly sliced, tomatoes halved, radishes diced, leaves pulled off cilantro stems. Salt generously with nice flaky salt, then dress with lime and a little olive oil and mix well. Et voilà – a not exactly authentic salsa but a nice way to transition from wintery citrus fruits to the promise of summery flavours. 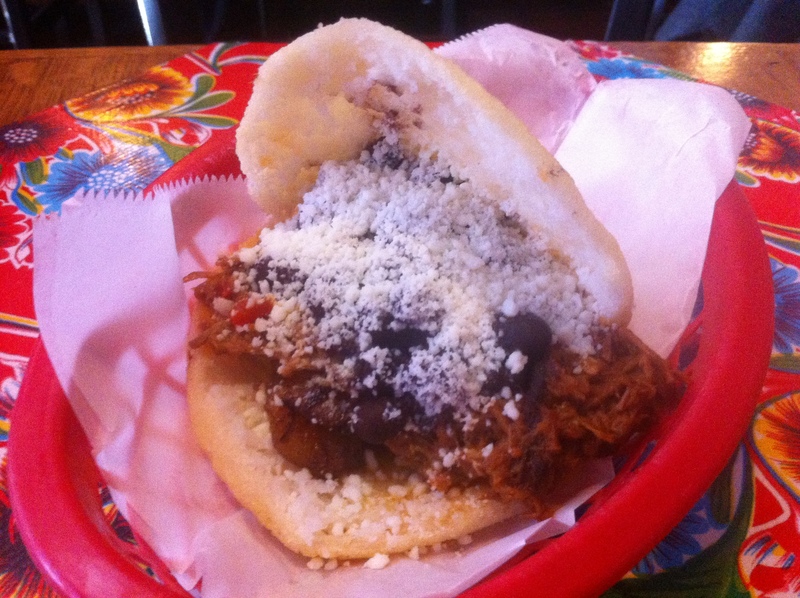 Eating arepas last week got me thinking about the cheap and delicious Latin food that used to sustain me when I lived in New York. I ate a lot of Cuban food, especially the ropa vieja from National Cafe, a great little neighbourhood place on First Avenue, now sadly closed. 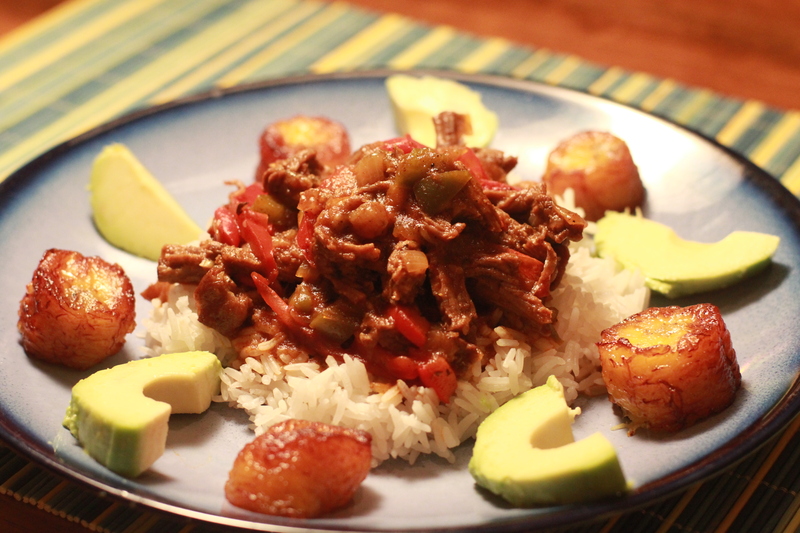 They also made plantains fried in pork fat, stuffed with ground beef and topped with crema. I could cry just thinking about them but it truly wasn’t a place for the diet-conscious. My other favourite haunt was Brisas del Caribe in SoHo – also now tragically gone – which in addition to mouth-watering Cuban sandwiches made amazing maduros, or fried ripe plantains. It was more or less impossible to finish both at one sitting, but there was no way not to order the sweet sweet plantains on the side. Since most of my last post on London eating was consumed by the vitriol I was aiming at the pop-up restaurant fiasco, I thought it might not hurt to return to the wonderfulness of Brixton market. I went there with Caribbean food in mind but before my enormous Guyanese lunch, I came across a storefront selling freshly griddled Colombian arepas. Actually, it was Mr Lemur who discovered it – the man can nose out South American food a mile off. 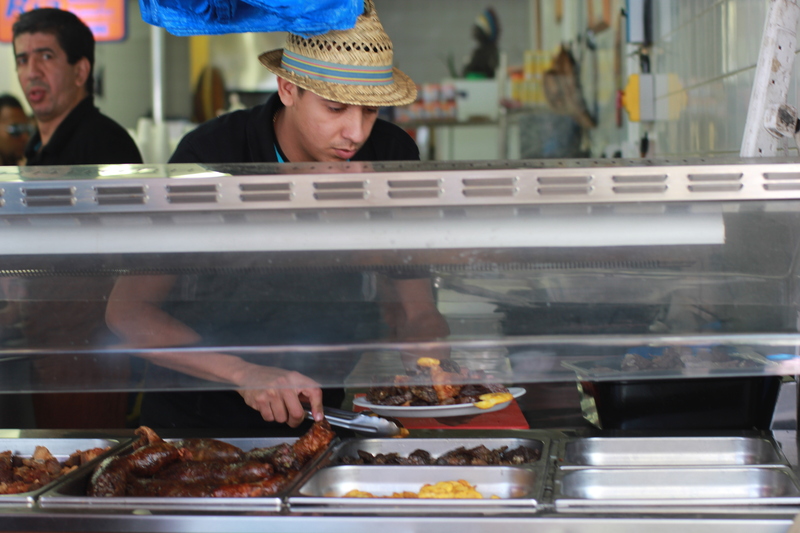 In the midst of a predominantly Afro-Caribbean section of Pope’s Road were a couple of shops focused on Latin American products and packed with Latino shoppers. 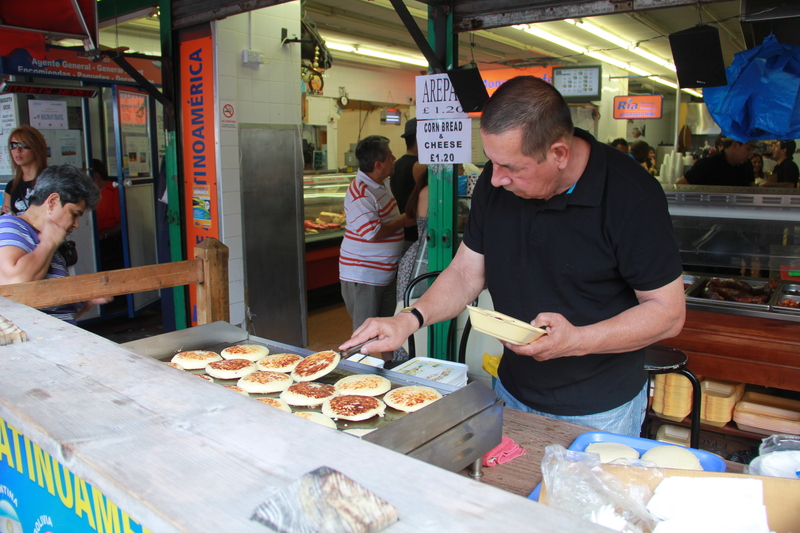 Out in front of Las Americas Butchers – which sells meat on one side and cooked foods on the other – was an old dude grilling cheesy arepas with a calm that can only be described as zen-like. I could have watched him lift and turn arepas all day. Actually, given how long it took for our order to cook, I kind of felt like I did. But that’s ok because while we were waiting, someone from inside brought out a paper plate of chicharrones to keep us going. I knew they were going to be good from the look of the hot meat dishes in the window. If there’s one thing you can be sure of it’s that Latin Americans know their pork, and these bites of pork belly and hot crispy skin were sublime. Washing the pork skins down with a sweet café con leche, Mr Lemur was in heaven. When the arepas were finally deemed perfect by the zen arepa-master, we scarfed them down in a blur of breakfast happiness. I’ve always been a big fan of corn-based breads and Colombian style cheese arepas are a particular favourite. 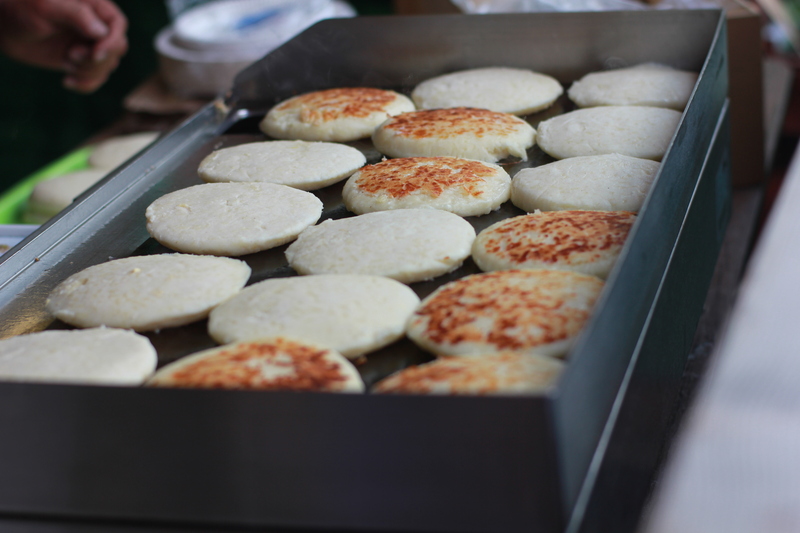 While Venezuelan arepas and Salvadorean pupusas are often stuffed with fillings, the Colombian ones are more like corn pancakes, often with cheese cooked through the dough. These ones were particularly cheesy and nicely caramelised from the griddle. For Mr Lemur, it was a chance to bust out his Spanish and for me it was a nostalgic reminder of New York, where cheap, greasy delicious Latin food is always within reach. But even if you don’t have a Latin connection, the combination of hot cheese arepas and café con leche (perhaps with a little fried pork if you’re that way inclined) is not one to be missed next time you’re in Brixton. 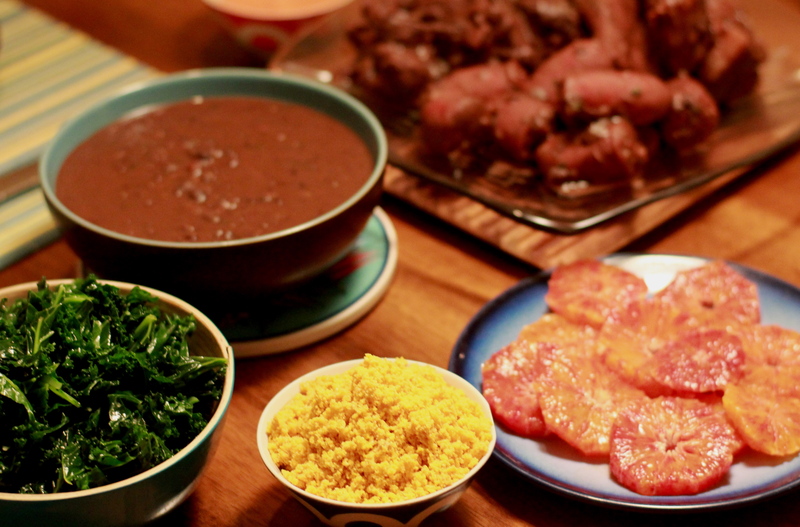 Since Mr Lemur was born in Brazil, he has a particular soft spot for Brazilian foods. It’s probably impossible to feed him black beans too often – we even have a local butcher from Brazil who offered to save us pig’s ears for feijoada – and my experiments in pão de queijo (little cheese breads) have been enthusiastically received. We even buy guaraná soda, which reminds him of his childhood in Rio and reminds me, weirdly, of Scottish Irn Bru, so everyone’s happy there. 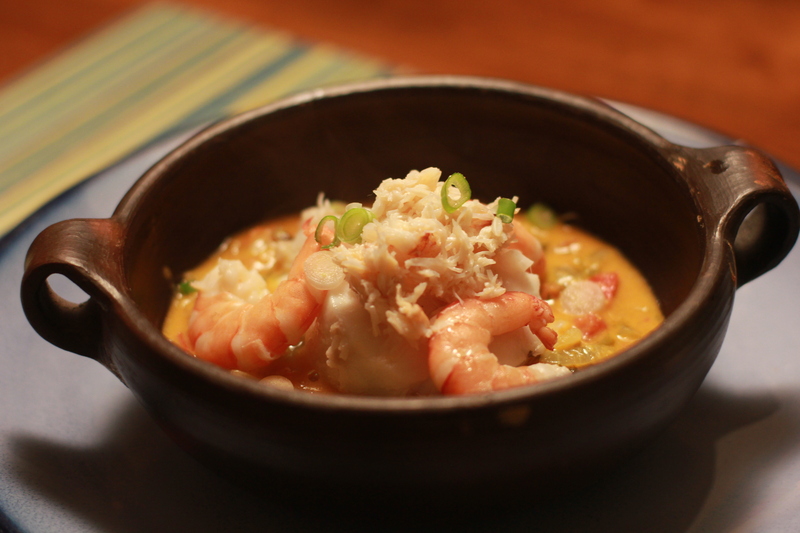 My favourite Brazilian dishes to cook, though, are the Afro-Brazilian flavours typical of Bahia: deep seafood stews like moqueca and vatapá, thickened with nuts and dried shrimp, and based on the rich foundation of palm oil or dendê. I love West African food (I was thrilled to find great Senegalese food in Paris recently) and so it makes sense that the Afro-Brazilian combination of West African nut-based stews with New World chilies, tomatoes and fruits would hit my food buttons. 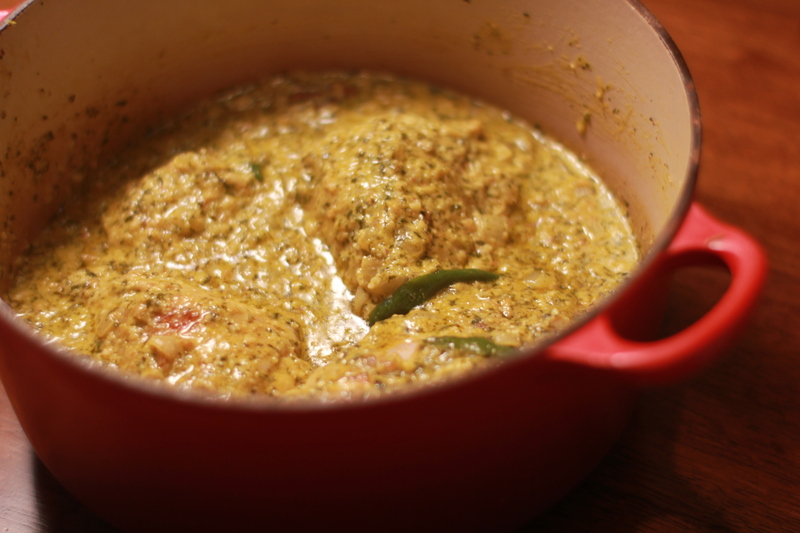 Xinxim de galinha is a classic Bahian dish, combining chicken and shrimp into an earthy stew that feels warm and reassuring even if you didn’t grow up with it. The main things that you might not have to hand to make xinxim de galinha are dendê and dried shrimp. The shrimp are easily found in any Chinese or Asian store. Look for fairly big shrimp that are nice and pink in colour – brownish and dull shrimp are probably older and the small ones are cheaper and less flavourful. 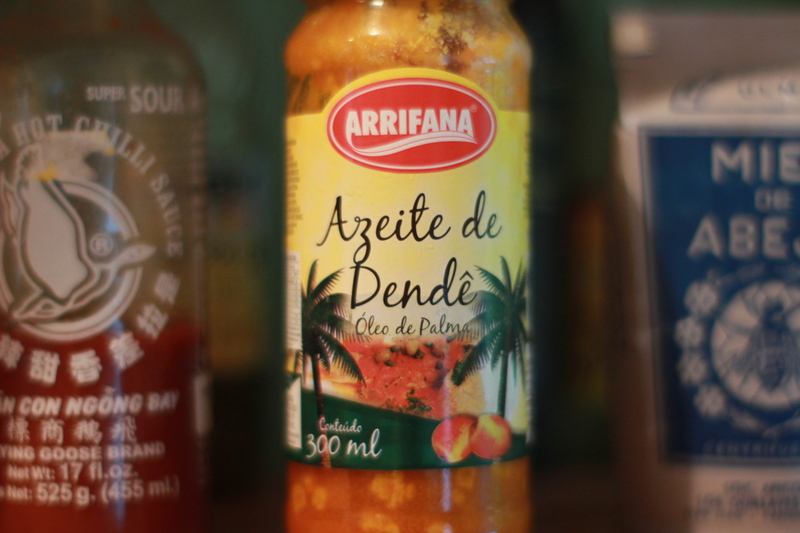 Dendê oil can also be found in many ethnic markets and maybe even the supermarket if you live in a diverse neighbourhood. It tends to separate in the jar but don’t worry, that’s normal. This bright orange oil makes all the difference to the colour and flavour of the dish. Roughly chop the garlic, ginger, spring onions and cilantro, place in a food processor with the lime juice, and process till fairly smooth. 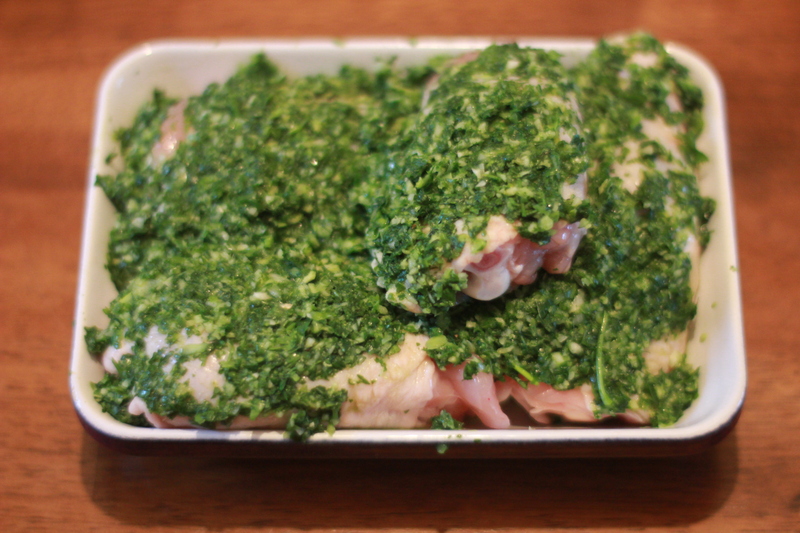 Pour this mixture over the chicken and marinade for an hour or till you are hungry. Meanwhile, toast the nuts on a cast iron skillet till golden and process to fine meal. 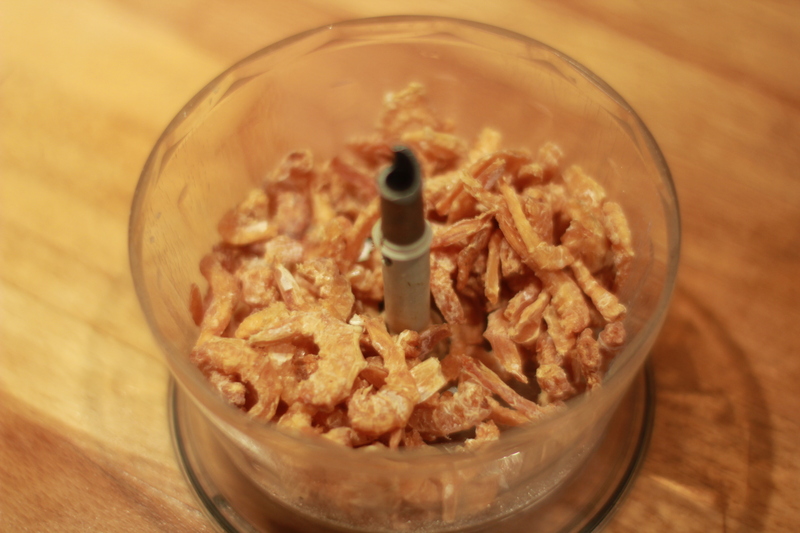 Next process the dried shrimp in the same way until fluffy. Cover and cook for 30 minutes, turning and stirring often. The sauce will stick easily so you need to keep quite a close eye on it. 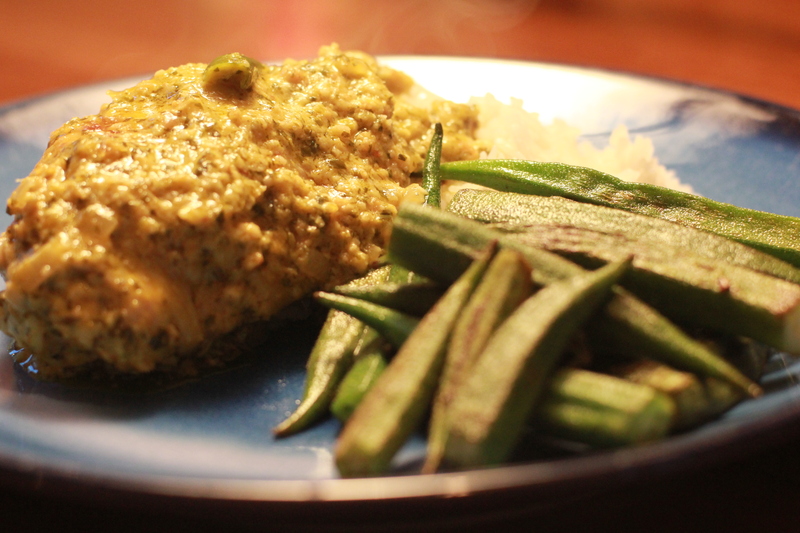 Recipe adapted from The South American Table by Maria Baez Kijac.